It’s on a day like this, with perfect blue skies, all day sun, and roaming round the crisp waters of Wellington’s bays, that you realise that our capital city lacks just one thing. A way to take the day time good times, and extend them on into the evening. 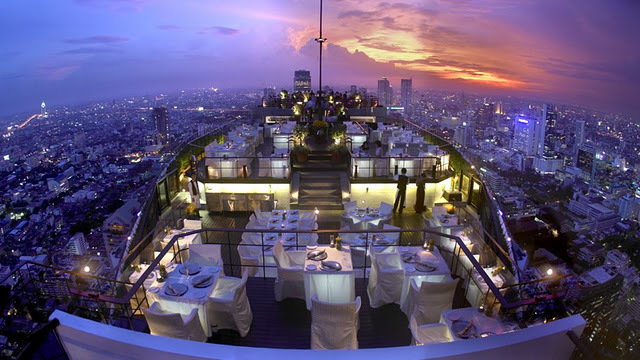 Yep – there is just one thing it misses – some roof top bars. When oh when is Wellington going to get one of these? And where would you put it if you had one? Probably needs to be up high, but not too high. Somewhere with a great view, but somewhere simultaneously out of the wind. So, I can agree that the top of the Majestic is not going to be the right place for this, but isn’t this a wonderful sight? Possibly the only thing that could make it better would be to have a hot tub up there on the roof as well, but that may be asking a little too much. It’s not impossible though. I have a friend in England with a jacuzzi and rooftop bar on the roof of his terrace house, and there’s nothing quite so magical as sipping cocktails, overlooking Hyde Park, whilst sitting in warm water and bubbles. The time is right for a rooftop bar at the very least – if not the hot tub as well – and where better to start than the place that is home to our bars and restaurants already? Rooftop in Courtenay Place may be a little noisy perhaps, so what about our other home of bars – Cuba St? Judging by the picture above, you don’t even need much water! or clothes! There’s probably a more suitable spot, but none more magnificent a location than: the roof of the Michael Fowler Centre. How about it Wellington? I love rooftop bars. 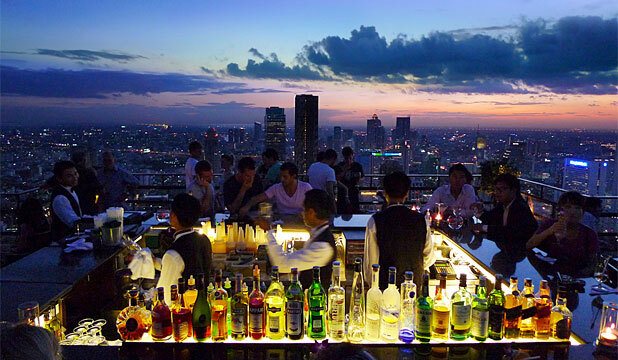 Rooftop clubs even such as Weekend in Berlin. The problem in Wellington is that it gets cold when the sun goes down, even in summer, so outdoor bars don’t suit the climate. 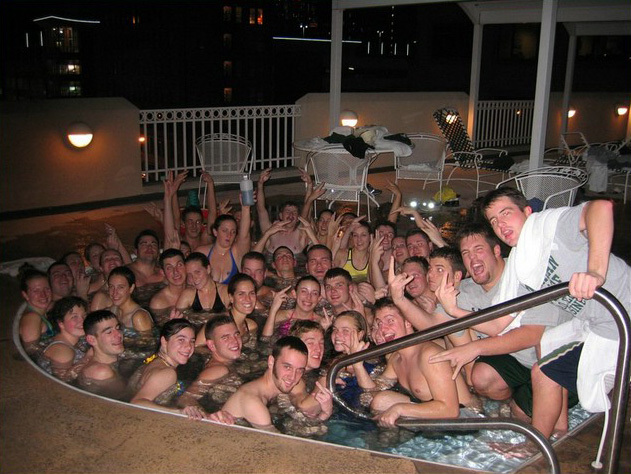 And the idea of a bar and hot tub combined? Would that keep you warm enough? I was getting enthusiastic until you posted those scary photos! I get why a fish would like a water option but I’ll be joining Jason, fully clad, at that indoors top floor bar, I think. Those ones in Bangkok work because it’s 30 degrees at night, and they are purpose built towers. I’m not sure where in Welly you’d have one. Perhaps more outdoor mezzzanine places along the Waterfront? A future hotel for instance. But it’s a good tourist draw – people love a view and if you can hawk some food and drink, all the better. Welly needs that casino first I reckon – perhaps they could be linked. Starkive – where is / was Windows on Wellington? I’m obviously not such a groovy old hipster as you are / were. No idea. Unless, perhaps, it is the same place that SD is talking about? The Skyline? I’m feeling like a 80s revival right now…. Max – WoW (the nightclub, not the frock-up) was on the top floor of what was then the Williams Building at the top of Plimmer Steps. Probably still the best view in Wellington, even if you can’t see through the girder work of the BNZ tower any more. They did settle the boilermakers’ strike, right? “Wellington has long been a place where people from all over New Zealand came to because there was work. What a melting pot! And yet, its a windy old rat-hole. The winters can be damp, and the summers are mild – not baking hot like in Gisborne. Those frequent southerlies slice through you like a knife. The threat of a big earthquake hangs over us like the sword of Damocles. Great rooftop bar above Cookies in Melbourne. In summer they show movies but even in the winter it’s packed. And it gets bloody cold in Melbourne too.